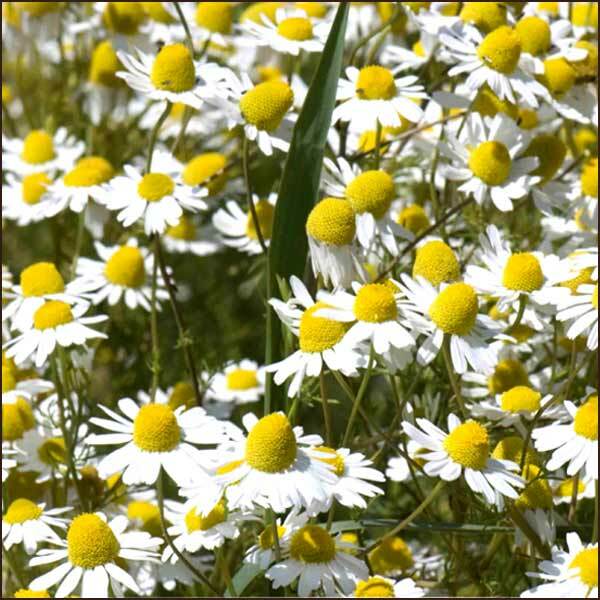 German or Roman type Chamomile used in holistic medicine. Has a blue oil considered the active ingredient in healing. Has relaxing and anti-allergenic properties. Also has flavonoids for cooling and relaxing. Typically used to treat tension, pain and fever, especially where digestive tract is involved. Use Chamomile tea as an overall sleeping aid, particularly when struggling with sleep apnea and restless sleep. Drinking a warm cup of non-caffeinated tea can help you fall asleep faster and wake up feeling more refreshed. If you are suffering from stomach irritation, ranging anywhere from mild bloating to irritable bowel syndrome (IBS) symptoms, then this tea can be a major help. Cramps, sedative soothes whining babies, teething, aches, etc. Gastro tract problems, gallbladder, tooth ache, ear ache. Intermittent fever, great for whiners. Stiff neck, colds, fever, flu, cough, bronchitis, spasmodic cough, asthma. Gaul stones, Edema, muscle/ligament tightness and tears. Bruising, rheuma pain, gout, carpal tunnel, eczema, burns, acne, impetigo, motion sickness and night terrors. Tea, dry or fresh, or apply mixture to skin with cloth or cotton.